Mwalimu Baruti talks about African Spirituality in this segment of ANU Asafo. He, is in his own words, “an Afrikan Centered Warrior, a Warrior Scholar, a Jegna/Elder-in-Training” and refuses to be anything less than that. Mwalimu Baruti comes from a peculiar stock of individuals that practice what they preach. He named his institute Akoben, which is the name for the war horn used to call the members of the community together for major decisions and dangerous times. As we are in perilous days, the horn has been blown. It is the community’s responsibility to prepare our children for the front lines and with his shule (Swahili for school) Mwalimu Baruti leads by example. With all of his years of unconditional service to the community, this Jegna is indeed walking on purpose in his divine self. But this could not be possible without the acknowledgement and honor to the ones whose shoulders we stand—our Ancestors. When Mwalimu Baruti talks about African Spirituality he makes its connection to our very identity. We need to return home to our traditional spirituality because we are a spiritual people. When the Yuguru or others speak about our community we are sometimes mistakenly labeled “religious”. But if we look at our history, Afrakans did not have a word for religious or spiritual or education. These concepts were so much of who we were that the label was unnecessary. They were prerequisites to be considered human. When the children came, ancestors have returned. So there is an emphasis on teaching good character and then being communal person. If good character was not developed then we can not have a community. In the current condition of Afrakans living in the corporation of the United States, you can see the aftermath of the breaking away from our tradition in the lack of love and respect for one another and the loss of self esteem. The model of developing good character in the younger generation and teaching the communal spirit has been severed because the Yuguru was successful in their campaign to weaken the family foundation and spookifying our traditional spirituality. The Ancestors innerstood that "right-ness" was defined in terms of what is beneficial to the community and "badness" by what is detrimental to the community. This common sense model should be adopted when taking inventory of every aspect of one's life. In the ANU spiritual training you can begin to learn how to have an integrated experience with your spirituality but also learn to decode the self-defeating programming of an oppressive society. 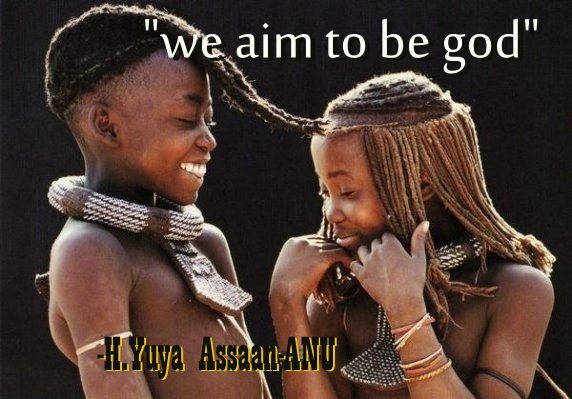 At the core, we as a community derive our center from the universe and with warriors such Mwalimu Baruti and H.Yuya Assaan-ANU we can return to our Maatian principles of truth, justice, harmony, balance, order, reciprocity, propriety.